Yesterday, I turned thirty-one, and I treated this birthday as a non-event, since the big three-oh didn’t mean the end of the world any more than 2012 meant the end of the world. I had the day off work, and I tried to spend my time doing the things I always want to do — happy-making, me-centric stuff, with less of a focus on what I have and haven’t accomplished one year further into my life. Please keep that in mind when I show you the painting I can’t stop looking at, and understand that no, this is not a plea for help in my battle against the grinding passage of time. I suppose there are worse ways to begin a new year than appreciating something for what it is. Hey I'm Alex. You may remember me from creating the Clio-"Eyes" video. I just wanted to comment that I saw Weenix's paintings a few months ago at the art museum, and was also moved by them, big time. 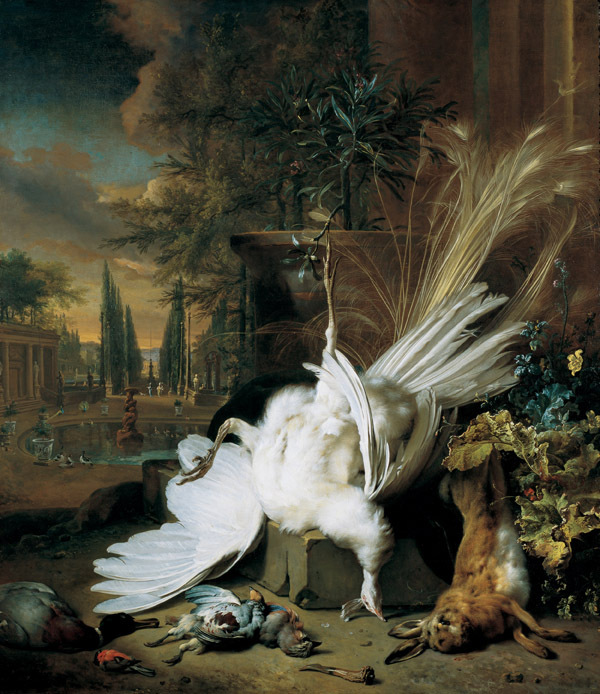 Particularly a large painting, that had the dead animals on a table paired with fruit. I felt like I was walking right into the painting, or maybe a dream. It's like it made me hear dark, classical music in my head, plus a physical sensation. It was unexpected and intense. So it's real cool to stumble upon a concurrent account of the enrapturing effect of Dutch Golden Age paintings. It's not exactly trending on Twitter. One more reason why I love your blog! Stay cool, and happy birthday! Hey man! Long time, no talk. I have to admit, I'm surprised I'm as moved by these as I am. They're not really the type of art that makes me feel much, and even reading about why they were painted -- fairly mundane reasons -- can't make me stop looking. So, been working on anything cool lately? In one of the Oz books, there's a creature called a weenix, which has the body of a bear and the head of a walrus. I'd like to think he also had the ween of a phoenix. "It's Been Such a Long Road for You, Hasn't It?"